Helping people stay active after retirement. The St. Louis Arc is committed to supporting people as they age. We coordinate activities that enhance an individual’s physical, emotional, spiritual, intellectual, environmental, and social well-being. For residents who may be retiring, the St. Louis Arc can help establish a new routine for their day, week, and month. Aging With Empowerment is a program for our residents and our Community Engagement participants. The overall goal is for people with intellectual and developmental disabilities to stay engaged with the world around them. Individuals complete an interest assessment to help identify which activities they want to join. Based upon common interests, our staff and participants work together to create a monthly calendar of activities. This allows them to choose which AWE activities they want to sign-up for. 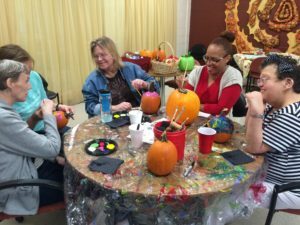 Previous activities have included: yoga, swimming, walking club, book club, card making, “Finding your Story”, knitting and/or sewing, photography, gardening, or wood working. For more information or to see the current calendar, contact Jessica Gantner, Assistant Director of Aging With Empowerment, at 314-810-1181.